If I am not mistaken didn't Francis move to Venezuela? What and he took the crate with him!?! Almost 3.5 years later ..... what became of this whisky? Interesting answer I received from an old family friend that retired from Jack Daniels. Said they used to label crates that way as well. The 64 for JD would be the year distilled. 86 the year bottled and the 232 the cask # or batch number if its a blended instead of single barrel. He did say JD stopped using wood crates prior to 86 and he thought most everyone in the industry did the same prior to then as well. So he finds it curios how I described this to him. He retired around 1990 and is almost as old as dirt so his memory may be off a little. I agree though what happened to this great find? Almost 4 years later... TIME FOR AN UPDATE! If I can find a buyer and sell it at a good price, I will. (assuming it's worth a "good" price). Since I could use the cash after I get back, I'll be more motivated to float the project to the top and get it appraised. If they don't turn out to be worth much, I'll just save money over the next few years on not buying whiskey, and drinking something with a great story behind it! At one time there must have existed more than one crate in the family. When my dad passed away in 2009, I found a half drunk bottle of the exact same stuff in his liquor cabinet. Since the bottle itself doesn't carry any particular identifying marks, I would never have known it was from the same vintage if I didn't have the crate bottles to compare to. That was from the already opened bottle. All 12 crate bottles are unopened. 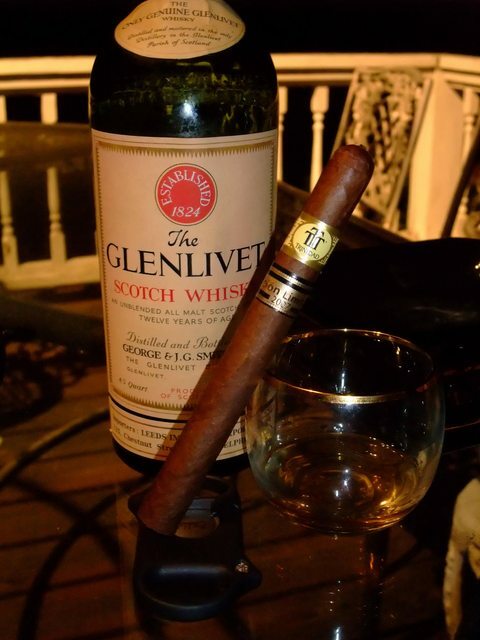 Tasted like standard 10-12 year Glenlivet. As others have noted, Whisky stops aging after bottled, so no miraculous way to turn it into 20 year single malt. But, it wasn't turned, so thats a good sign for the unopened bottles. I did end up carefully opening the crate to inspect the bottles inside, see what kind of condition they were in. Overall condition was excellent. Boxes showed a bit of damage at the bottom half, possibly from humidity, but labels in good condition and no sign of mold or other damage to the upper neck area that could impact the seal. Before I left, I had done some more work on dating the bottles and asked around on a whisky forum. The company in Mount Vernon (marked on the shipping crates) became the official distributor in 1963. Thus concluding that it puts the crate at 1963 at the earliest. 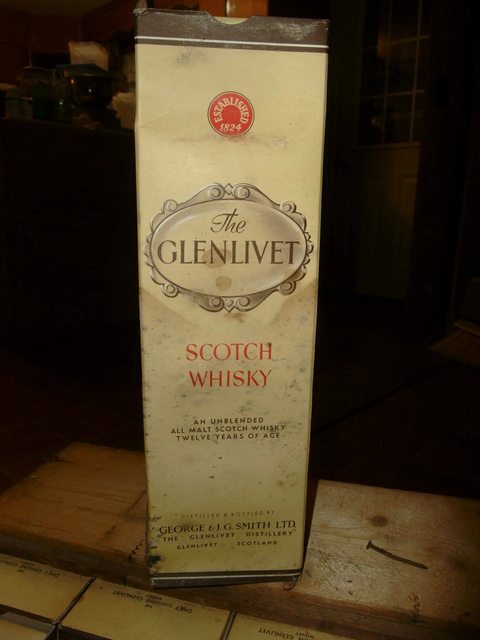 The label design that seems to nearly match mine exactly (particularly the "The" in The Glenlivet is found on bottles listed as being bottled in 1969. Labels from the 1970's are very different, its clearly pre 1970. And a label from 1950 also looks very different. 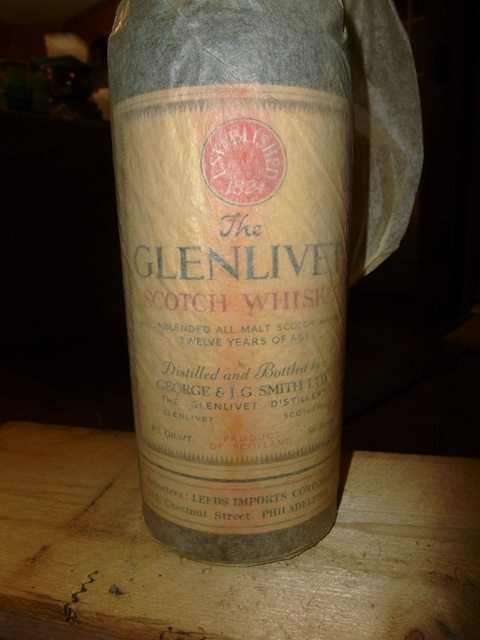 Pricing on the site: All of the pre-1970 whisky on the site is 18-21 year aged stuff, so no pricing help there. Bottles of 12 year vintage like mine from the 1970's are listed at £175, but again, that doesn't reflect real world "value". The final piece of the puzzle is centered around the mysterious number codes on the box that dijit's old timer JD friend was looking at. That one is a bit of a puzzle. Based on the evidence, I think its highly probable that 64 is the bottling date. it's post '63 and pre '70, fitting all known evidence to this point. I'm at a loss to guess what the 86 is then. And 232 could certainly be the cask number. Value: Maybe $150/bottle. Could be double that to a collector that wants the whole case, or half of that. Further inquiry is required in that field. History: I would be willing to bet that my father acquired the case from my grandmother's cellar when she moved out of their large ancestral home and retired to Florida sometime around 1995-2000. My grandfather was a restaurateur and easily could have purchased a few cases through his own bar to keep around the house for drinking. Very cool info Francis. Great find. I hope it finds a home that will appreciate it, including if that means you just choose to enjoy it yourself. how hot does the attic typically get? I was thinking that might happen at Shack, but it's looking increasingly unlikely that I'll be back in time for Shack this year. Unless things come through earlier than planned (waiting on the visa for my wife to get approved). That's been a big question in my mind as well. It's tough to say. The attic was mostly insulated, but not particularly well ventilated. If I had to pull a number out of the air, I'd be tempted to guess 90-95 f. It didn't fluctuate too much. The bottles being stored inside of the bottle box and the wooden crate likely helped to regulate humidity levels at the bottle point. The attic was in Ohio, so fairly typical northern weather, a month of "summer", but not the 110 degree Arizona summers . 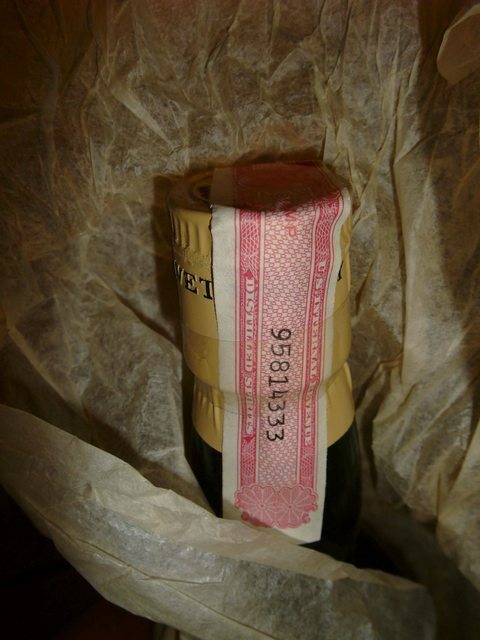 Most likely before that (pre-2000) it was in a Massachusetts wine cellar. Best info I could dig up googling regarding whiskey storage temps. Everyone says cool dry, but since whiskey is distilled at high temps already, others have noted that temp doesn't affect it much (but constant fluctuations do). This was the only real solid answer that I could find which explained the WHY cooler temps are recommended. Maybe it's B.S., IDK, seems reasonable to me. I noticed very little talk about storage temps browsing the old whiskey websites, so if it were more important than evaporation levels, I would have expected more chatter on it. Why does heat affect Scotch? It’s really a mixture of heat and humidity but it has to do with evaporation. 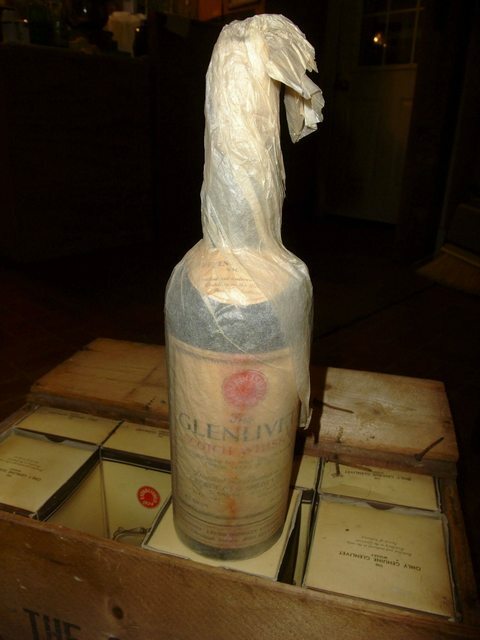 Scotch, unlike wine, doesn’t mature in the bottle so there’s really not an “ideal” temperature (unlike wine, which is said to mature best between 55° and 60°F). You want to keep it fairly cool because a higher, dryer temperature will result in faster evaporation if the seal of the cork is not 100%. Last edited by spectrrr; 06-20-2016 at 03:17 PM. If you ever decide to sell one or more of those bottles you might consider contacting Ralfy. He's a well-known reviewer of Scotch whiskies (and other liquors) on YouTube. Here's a review he did comparing 1960's and 2000's Johnnie Walker. Hey Spectrrr, has there been any new updates as far as these bottles? Wow! That is quite the history for those bottles. That is one fantabulous find. Congratulations!